• Even though this book came out after the book Little Quack, the very first paintings of Gladys were done before Derek was hired as the illustrator for Little Quack. The pictures of Gladys were what convinced an editor at Simon & Schuster that Derek was the right illustrator for the job. • Gladys wasn't always a girl. It's true! When Derek first created his gorilla character, he thought that she was a boy gorilla, but he quickly came to his senses. • It takes ten colors of paint to make one picture of Gladys without anything else around her. 1. 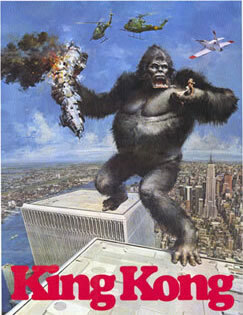 Derek was obsessed with King Kong when he was growing up. The 1976 movie with Jeff Bridges and Jessica Lange came out when Derek was just seven years old and he has loved gorillas (especially GIANT gorillas) ever since. 2. When Derek was a kid, growing up in Ames, Iowa, a full grown bull (horns and all) escaped from the Veterinary Lab at Iowa State University and made it's way across town to Derek's backyard. It charged after Derek, his friends, and neighbors for more than half an hour while the authorities tried to decide what to do. Derek has always wondered where that bull was going. He decided that it was probably hungry. 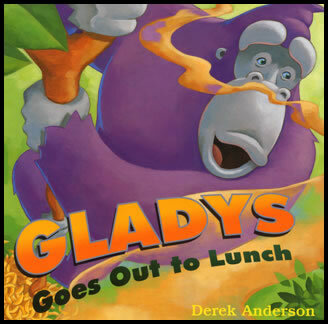 • The author picture on the back jacket flap of Gladys Goes Out to Lunch is a nod to both King Kong and Derek's hometown. 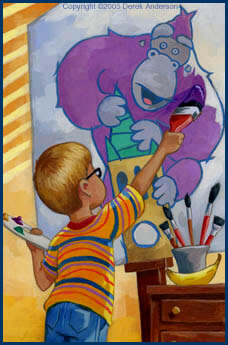 It shows Derek painting a picture of Gladys climbing a tower (the way Kong scaled the Empire State Building). The tower is the campanile, a bell tower and landmark in Ames, Iowa where Derek grew up. • In the very first drafts of the story Gladys Goes Out to Lunch, Gladys hated bananas. But it was eventually changed so that she loved them. • Derek doesn't like bananas. 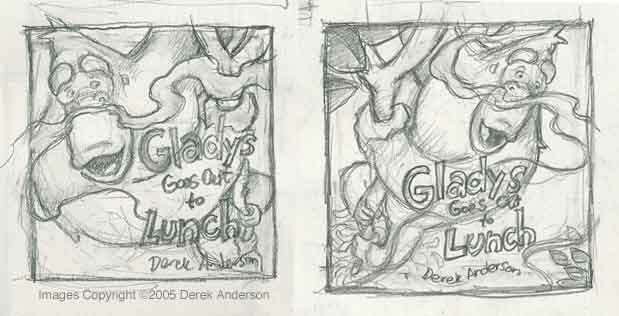 • Derek actually did two different paintings for the cover of Gladys. After doing the first, he discussed it with his editor and the designer at Simon & Schuster and it was agreed the cover needed to be more dynamic. Derek did several more sketches and the final cover ended up being a combination of the two sketches shown above. • Little Quack makes a cameo appearance in the book Gladys Goes Out to Lunch, but you'll have to look hard to find him.